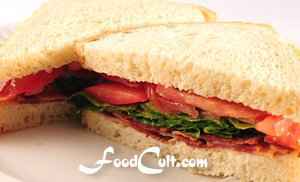 Bacon, Lettuce and Tomato Sandwiches or BLTs! a cooking knife + cutting board/surface. 3 to 4 strips of bacon or your favourite bacon-styled product (three is 25 % less salty). lettuce - we use fresh, around 4 to 5 leaves of leaf lettuce from the garden - while in season. place tomato on the top - peppering it well (or to taste). I always like to cover the pepper with, at least, an extra sliver of tomato. close the sandwich and slice to serve. Best served with a bowl of Fresh Cole Slaw and a small serving of fresh, deep fried potato (french fries). Prep time for cole slaw? Under 1/2 hour by hand or 10 minutes (including clean up) with a food processor. Tweak 'em 'til you love em ... and remember, great BLT? Fantastic Clubhouse sandwich! Got fresh basil? Try a little shredded on this sandwich. It adds a fresh, bright flavour to a favorite, old standard! There are a million ways to do anything. We are fortunate - we have three varieties of lettuce growing on our little patch ... so, in this sandwich we like to mix them up a bit - get a variety of flavours in a single bite. We like to use chicken or, sometimes, turkey bacon on these. These alternatives contribute to the full range of flavours from which the BLT benefits. Tofu remains, at this time, untested although I could imagine some preparations of seitan (also untried) being quite nice. Because we use chicken or turkey, while they may not be actually kosher and/or hallal, these are certainly kosher or hallal style for this traditionally non-kosher/hallal, classic sandwich. The BLT is, of course, a sandwich classic but this doesn't preclude taste adventures. We haven't tried too many re-arrangements of this classic. We think it benefits most from the textures of a traditional, basic loaf bread (although trying variations of the Basic White Bread Recipe is quite in the cards - it's excellent on a light sunflower seed-rye). While the BLT is usually toasted, some like the bread un-toasted. We think both can be great! We think it important to note that this classic BLT sandwich is a critical element ... a building block of the Club Sandwich and, so, if you love the Clubhouse, learn the foundation of that classic - the BLT. 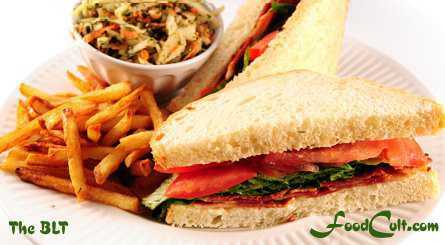 Of course, this bacon, lettuce and tomato sandwich is almost always served with french fries and coleslaw. Try the BLT on pita for a delightful alternative! Is this your favourite sandwich? Want to see more of it? Put it on your desktop!